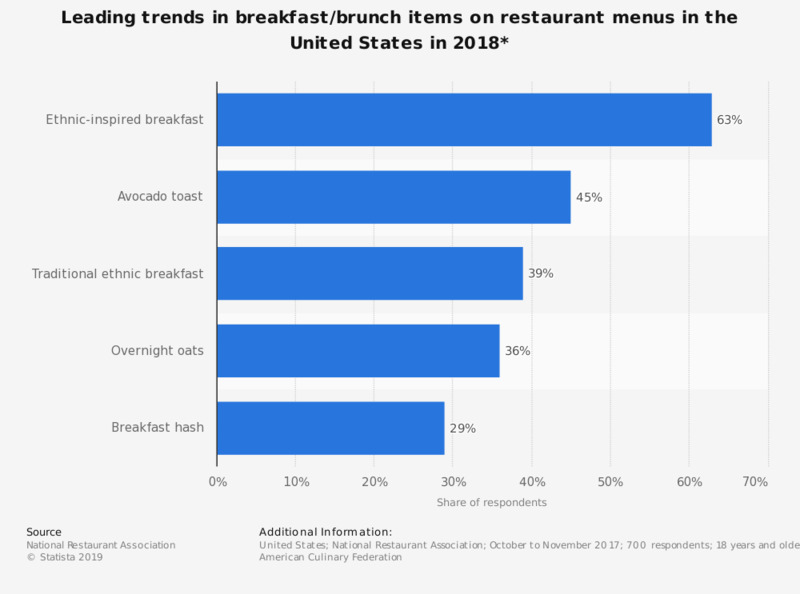 This statistic shows the leading five trends in breakfast/brunch items on restaurant menus in the United States as forecasted by professional chefs for 2018. During the survey, 63 percent of the respondents stated that ethnic-inspired breakfast items (e.g. Asian-flavored syrups, Chorizo scrambled eggs, coconut milk pancakes) would be a "hot trend" for restaurant menus in 2018. During a survey among chef members of the American Culinary Federation it was found that new cuts of meats and African flavors would be seen as the “hot trend” for restaurant menus in 2018. Both of these has a share of 69 percent, each. Another trend on U.S. restaurants menus was environmental sustainability, followed by the use of natural ingredients and minimally processed food. Additionally, pickling was the leading food preparation method used in restaurants and doughnuts with non-traditional filling was forecasted to be the most popular trend in desserts in 2018. Despite the new restaurant trends, consumers often cite food taste and prior experience as the factors that most influence their decision to revisit a restaurant. While seemingly growing in popularity in recent years, free Wi-Fi and in-restaurant technology were the least popular reasons to revisit a restaurant among respondents of a Deloitte survey. The number of people who visited any type of restaurant in the United States grew from 217.66 million in the last month as of spring 2008 to 233.73 million in spring 2017. In the 6 years from 2008 to 2014, the number of restaurant visits by families decreased by one billion. Ethnic-inspired kids' dishes, gourmet items in kids' meals and healthful kids' meals were forecasted to be some of the leading trends for kids’ meals on restaurant menus in 2018.